Pistons, Rings, Rods & Parts. Timing Belt Kit Water Pump Fit 03-07 Mitsubishi Lancer Evo VIII IX TURBO 4G63T. Guaranteed to fit and meet the specifications of the OE parts being replaced. OE quality belt construction provides durability, performance and reliability. Premium quality tensioner and idler pulleys help to assure correct tension and operation. Advanced manufacturing technology ensures durability and optimum operation. Specialized designs yield significant and noticeable improvements to your car engine. Remark: Hydraulic Tensioner / Adjuster is not included. 24/7 Support Ask product experts. 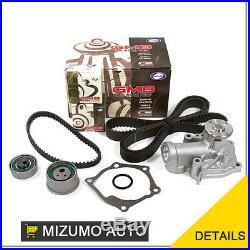 Aftermarket replacement timing belt kit and water pump for 03-07 Mitsubishi Lancer Evo VIII IX TURBO 4G63T. Located in the engine compartment behind the drive belts, the timing belt keeps the crankshaft in sync with the camshaft(s), essentially ensuring the proper timing and operation of the engine and its valves. When replacing a timing belt, also replace tensioner, and pulleys. Failure of pulleys and tensioners, after replacing only the belt, can cause valve or piston damage and lead to more expensive repairs. Additionally, timing belt driven water pumps should also be replaced at the same time as the timing belt. Operated by the drive belt, the water pump's core function is to allow coolant to flow into the engine continually. Together, these three components: timing belt, tensioners and pulleys, and the water pump are essential to the overall health of your engine. Ignoring the replacement of a timing belt as a part of scheduled maintenance could result in major engine failure down the road. Be sure to use our aftermarket replacement timing belt kit when the timing belt is serviced for the best performance. 1 Timing Belt (153 teeth). 1 Balance Shaft Belt (65 teeth). 1 GMB Tensioner (bearing assembly). 1 GMB Balance shaft Tensioner (bearing assembly). GMB is one of largest global manufacturers of OE and Aftermarket automotive products. Since 1943, GMBs manufacturing quality has been recognized within the industry beginning with Tensioner and Idler Bearings, Water Pump, Universal Joints. Our product lines represent affordability, quality, and performance to meet the demands of todays challenging market. In addition, Evergreen parts meet or exceed the strict standards of QS9000, ISO9001, and ISO9002. Our gasket line is manufactured with non-asbestos materials, the finest silicon rubber, Viton valve stem seals, and graphite or MLS (multiple layer steel) head gaskets for superior sealing. Our gasket product line provides our customers with competitive cost coverage on popular late model domestic applications. For all your early to late model import needs we carry a full range of gaskets and internal engine parts in addition to our new product lines of: Timing Belts & Kits, Water Pump, Head Bolts. Mizumo Auto is located in Southern California, the most diversified import automotive market in the nation, thus, allowing the company to continually study market trends to help forecast future product needs, and enhance development to exceed industry standards of both quality and performance. Mizumo Auto offers national sales and support services along with a fast program to insure our clients get the parts they need now. The item "Timing Belt Kit Water Pump Fit 03-07 Mitsubishi Lancer Evo VIII IX TURBO 4G63T" is in sale since Friday, June 21, 2013. This item is in the category "eBay Motors\Parts & Accessories\Car & Truck Parts\Engines & Components\Timing Components". The seller is "mizumoauto" and is located in South El Monte, California. This item can be shipped to United States, Canada, United Kingdom, Denmark, Romania, Slovakia, Bulgaria, Czech republic, Finland, Hungary, Latvia, Lithuania, Malta, Estonia, Australia, Greece, Portugal, Cyprus, Slovenia, Japan, Sweden, South Korea, Indonesia, Taiwan, South africa, Thailand, Belgium, France, Hong Kong, Ireland, Netherlands, Poland, Spain, Italy, Germany, Austria, Russian federation, Israel, Mexico, New Zealand, Philippines, Singapore, Switzerland, Norway, Saudi arabia, Ukraine, United arab emirates, Qatar, Kuwait, Bahrain, Croatia, Malaysia, Brazil, Chile, Colombia, Costa rica, Dominican republic, Panama, Trinidad and tobago, Guatemala, El salvador, Honduras, Jamaica.